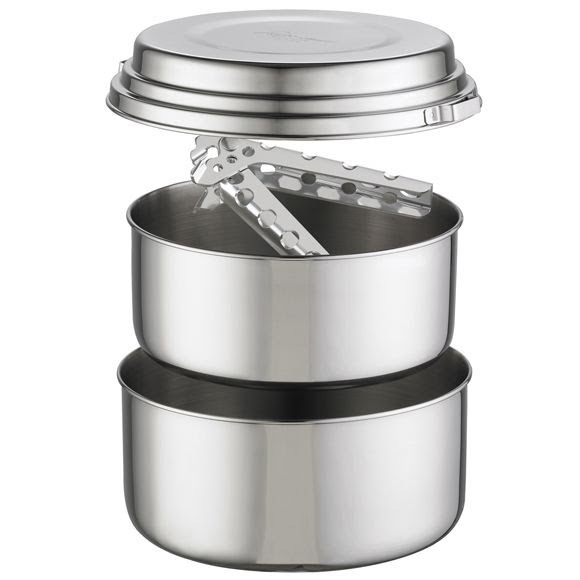 The Alpine 2 pot set is made from incredibly durable stainless steel, reliably standing up to even the most extreme conditions. It's perfect for heavy use by frequent travelers, or by guides and institutions, or anywhere you'll be preparing a lot of meals across a wide range of adventures. Includes: 1.5L pot, 2L pot, lid/plate, PanHandler pot handle, and stuff sack. The Alpine 2 pot set is made from incredibly durable stainless steel, reliably standing up to even the most extreme conditions. It&apos;s perfect for heavy use by frequent travelers, or by guides and institutions, or anywhere you&apos;ll be preparing a lot of meals across a wide range of adventures. Includes: 1.5L pot, 2L pot, lid/plate, PanHandler pot handle, and stuff sack.